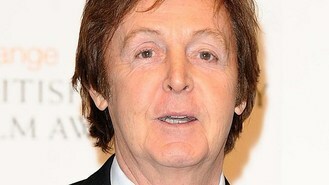 Paul McCartney is set to release his second album in the space of a year in October. Former Beatle Paul put out his first studio album in five years, Kisses On The Bottom, in February and has announced he will follow it up towards the end of the year with record New, according to Billboard. It will feature his latest single of the same name, produced by Mark Ronson, and Paul teased the album name on Twitter when he posted a list of words that go with "new", such as lyweds, fangled and Orleans. New, set to be released on October 15, will include 12 tracks and there will also be a deluxe edition with two bonus tracks. According to Rolling Stone he has been working with other producers including Ethan Johns, Paul Epworth and Giles Martin, although it's not yet known whose work has made the cut. Kisses On The Bottom was largely a collection of covers which makes New Paul's first release of original songs since 2007's Memory Almost Full. Katy Perry has brought forward the UK release date of her new single, Roar. Christina Aguilera has written a lengthy thank you letter to fans for their support over the years. Boy George has announced plans to release a new album for the first time in 18 years. Mumford and Sons fans who didn't enjoy their performance at the reopening of the Forest Hills Tennis Stadium can request a refund. Alexandra Burke has hit out at her footballer ex Jermain Defoe in her new single Day Dreams. Britney Spears has hinted that she is rehearsing for a new music video.